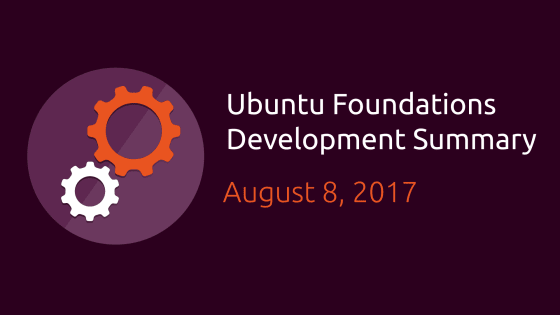 If you would like to reach the Foundations team, you can find us at the #ubuntu-devel channel on freenode. Cloud images for Xenial and newer have been released with updated packages, including the kernel, which has fixes to address CVE-2017-7533. Matthias Klose, Dimitri Ledkov, Balint Reczey and Mathieu Trudel-Lapierre are on their way to DebConf. If you’re heading there also, say hello! The GCC 7 transition has begun in artful-proposed; GCC 7 will be the default in 17.10, please help ensure your packages in the archive are up to date and ready to build with this new toolchain. The transition to Perl 5.26 is in progress in artful-proposed, with some delays due to issues with the autopkgtest infrastructure and a sync of a reupload from Debian. This is expected to reach artful early next week. The python3 transition continues, with python3.5 being dropped from the list of supported versions in artful-proposed. Packages uploaded today will build without python3.5 support, and python3.5 will be dropped from artful before release. 16.04.3 point release came out on August 3, 2017!